Momentum for Constitutional Carry (HF309) is surging! Over the last couple of weeks, folks like you have been pouring phone calls into the capitol in St Paul with one message: support, co-sponsor and PASS HF309, Constitutional Carry legislation! And let me tell you, they’re starting to get the message. Just last week we told you that Representative Newberger and Howe signed on to HF309, thank to your calls and emails. And we told you that we couldn’t let up. Now, thanks to even more of your phone calls, more politicians are getting the point! Just on Friday, we received word that in addition to Reps Newberger and Howe, Representatives Gruenhagen and Erickson have signed on to Constitutional Carry as well! This is FANTASTIC news as it’s proof that your calls are having just the effect intended. That makes Rep Drazkowski, Hertaus, McDonald, Lohmer, Poston, Newberger, Howe, Erickson and Gruenhagen so far as co-sponsors. Some of these legislators aren’t exactly known for being strong supporters of the Second Amendment. What they ARE known for, however, is being strong supporters for their own political careers and reelection campaigns! This is what mobilized gun owners are doing here in Minnesota – you’re proving all across the state that refusing to play ball on the Second Amendment is a fast track to early retirement! Just ask former politicians like Rod Skoe, Lyle Koenen, Will Morgan, Tom Hackbarth and more! THAT is why we’re seeing politicians from all over the state now jump on this bill. Most of them are indeed pro-gun, but ALL of them are following the lead of pro-gun champion Representative Cal Bahr. That’s why your representative needs to hear from YOU right away! After the browbeating gun-grabbers took in the last elections, NOBODY in St Paul wants to become the next “former” State Senator Rod Skoe. So thank you so much for all of your calls. But now is the time to double down and keep the calls pouring in! Now is NOT the time for them to put gun owners in the drawer to be pulled out when the next election rolls around! 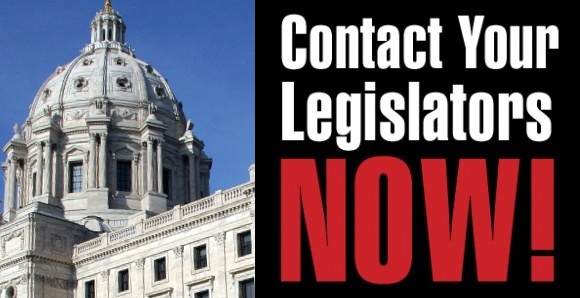 So please call every one of them and insist that they follow through and co-sponsor Representative Cal Bahr’s HF309, the Minnesota Constitutional Carry bill! Thank you for taking action and we’ll keep you updated as this fight progresses!